A bad embouchure for saxophone is very easy to learn. The hard part is trying to unlearn it after you’ve created this bad habit. Below are common characteristics of poor embouchures frequented by young or careless saxophonists. Don’t puff the cheeks out. This is one of the most common creators of a bad embouchure. The cheeks are like walls in a hallway. If you stand in a hallway, are the halls bowed out and flimsy? Or are they straight and firm? 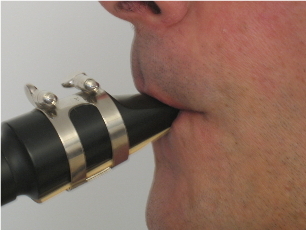 The cheeks form a channel the airstream follows to the mouthpiece. Aim the airstream straight down the neck of the sax. Do not send it to the top or bottom of the mouthpiece. Most of the time, this can be achieved by correctly adjusting the neckstrap. Make sure the lower lip is not curled out. This will cause squawking, poor tone, and lack of control. Many young players do this because they cannot hold the lower corners of the mouth firm for any length of time, until they develop strength there. The opposite problem is curling the lower lip over the bottom teeth too much. This also causes squawking because there is too much flesh on the heart of the reed. Interestingly, it takes more physical effort to maintain this position than it does to hold a correct embouchure. 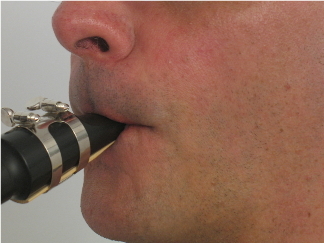 The double lip embouchure is considered an incorrect embouchure by most, but some players—even professionals—use it for various reasons. It includes curling the upper lip over the top teeth. The most common reason sax players use this is they have sensitive teeth, and it provides comfort while they play. For these players, even a rubber pad on top of the mouthpiece does not give relief from the vibrations or strange sensations they get when playing. 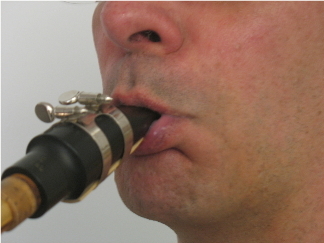 Some players use a double lip embouchure purposely, claiming that it opens the mouth cavity more and thereby darkens their sound. This may be true, and it may work for them. But for most, it reduces the degree of control they have over their playing. Use this type of embouchure with the greatest of caution, and do not introduce it to beginners unless absolutely necessary. Of course the easiest solution to solving a poor embouchure is to avoid it altogether from the beginning. Why not save time, effort, and aggrevation, by learning a proper, correct, and good embouchure from the start?